Provence Park Shore Condos: COMPLETELY RE-IMAGINED! Start living the Naples lifestyle today, with the Gulf, shopping and dining just steps away! Save almost 3 YEARS as the work has been completed for you. Embrace this completely remodeled, turnkey, penthouse condominium that is one of a kind. For the discriminating buyer this residence encompasses the entire building floor, allowing for 360° panoramic views of the Gulf of Mexico, to the distant everglades, out to the coastal crescent of Sanibel Island and down to Marco Island. Enjoy 2,077 SF of outdoor terrace which is the perfect space to enjoy the stunning views. Decorator furnished with four bedrooms and office all with en suite bathrooms. Each having their own unique style , yet blending beautifully thru-out the residence. Your gourmet kitchen was designed with Audax and Blanco Romano stone. High end appliances include, Sub Zero refrigeration, Gaggenau induction cook top, Wolf convection oven and warming drawer and a Miele coffee bar. Theres a show stopping custom glass and stainless steel wine closet with ample storage. Offering three parking spaces, private cabana and boat slip, this residence is fit for reflection on success! Enclave At Park Shore Park Shore Condos: Offering dramatic and incomparable 360-degree views along Gulf Shore Boulevard North, this is the first opportunity for purchase of one of the most prized penthouse residences within Naples most prestigious buildings, the Enclave at Park Shore. The Enclave is home to only 28 residences, with each residence occupying an entire floor. Penthouse 4 is nestled on the premium top floor location and offers one of the most coveted, unobstructed views of the Naples beachfront and surrounds, complete with a private rooftop open air deck space. Thoughtfully customized by its original owner, a visionary and celebrated international author, this residence exudes an elegant, yet comfortable ambiance. Penthouse 4 offers an expansive floor plan encompassing over 7,600 square feet with four bedrooms, private office and four full baths. This home offers expansive views, floor to ceiling windows in nearly all living spaces, marble flooring, skylights and thoughtfully designed custom built-ins. Penthouse 4 comes complete with a private three-car attached garage area, which provides immediate access to the Enclave beach walkway and pool area. Le Rivage Park Shore Condos: Perfectly situated along the Gulf and boasting a private walk out, this extraordinary residence lives like a beach house with breathtaking 360-degree views. Truly remarkable and featuring over 8,000 total square feet with a gracious master, separate suite with kitchen for guests or in-home care, built in garage storage area, private additional interior storage and an expansive outdoor terrace, this exceptional gem offers unrivaled luxuries. Idyllically located only a short walk to the Venetian Village and central to the fine dining and shopping of downtown Naples and Waterside Shops, this rare opportunity to own a true beach walk out in one of Park Shore’s most renowned buildings, Le Rivage, cannot be overlooked. To complete the beach house lifestyle, Park Shore residents are eligible to lease or purchase a boat slip in the Venetian Bay Yacht Club. Le Rivage Park Shore Condos: Enjoy Gulf of Mexico views to Sanibel and beyond from one of Naples’ most sought-after buildings! This rarely available south side offering is comprised of over 6,000 square feet of living area with four full bedroom suites, four-and-a-half baths, library, great room, formal dining area and family room. Estate Fifteen South boasts neutral tones throughout and three terraces to enjoy sunrise-to-sunset views. Building specifications include floor-to-ceiling walls of glass, ten-foot ceilings, eight-foot doors, gas cooking and a water detection system. Le Rivage offers the complete luxury lifestyle with unmatched amenities, including 24-hour front desk attendant, saline pool and spa, gorgeous social room, top-notch fitness room, massage room, two Gulf-view guest suites, three parking spaces, as well as an air-conditioned storage locker and beach storage. The Village on Venetian Bay is nearby and has been heralded for its waterfront setting, wonderful dining and eclectic mix of specialty retailers. Park Shore residents may purchase or lease a boat dock located on Venetian Bay. Le Rivage Park Shore Condos: Directly on the beach, Le Rivage Estate Eighteen North savors explosive Gulf, Venetian Bay and dramatic coastal views sunrise to sunset. Encompassing 6,131 square feet of AC space. The architectural design features 10-foot-high ceilings, 8-foot doors, along with dramatic walls of glass. Expansive lanais, spacious great room, family room, gas fireplace, gourmet kitchen and custom library. The master suite captures extraordinary coastal views and offer his-and-her private baths. The guest suites offer sensational Venetian Bay views. With state-of-the-art amenities, residents enjoy an ultimate lifestyle complemented by the utmost privacy and security. Steps from Venetian Village, fine dining and boutique shopping; all in the heart of Gulf Shore. Le Parc Park Shore Condos: Magnificent Penthouse with sweeping Gulf views. Views all the way to Sanibel Island. Floor-to-Ceiling glass and clean contemporary lines. 6428 square feet under air. Features 5 bedrooms, all en suite and all with walk-in closets. Powder room. Library/office with custom built-ins. Formal dining room adjacent to wet bar and wine room. Large, open kitchen with morning room. This Penthouse has its own private 2 1/2 car garage with storage. Le Parc features a beachfront pool and spa, a modern fitness facility, sauna facilities inside and out, a Har-Tru tennis court and a large, well-appointed social room. Private location at the end of Gulf Shore Boulevard. Walk to Venetian Village shops and restaurants. Enclave At Park Shore Park Shore Condos: Enjoy the 360-degree panoramic coastal views of Naples and Southwest Florida from just beneath the clouds in your palatial residence. This beachfront estate, encompassing the entire 15th floor, is designed to provide warm intimate comfort throughout or for grand celebrations with family and friends. Feel the gentle Euro-Caribbean coastal influences from the warm soothing décor accented with natural wood and marble, embracing the outside surroundings in perfect harmony. With only 28 residences in the Enclave, there are very few opportunities to enjoy this remarkable lifestyle. Le Parc Park Shore Condos: Breathtaking floor-to-ceiling Gulf views and stunning modern finishes define this one-of-a-kind Le Parc residence. Boasting an expansive great room and gourmet kitchen, this is truly an entertainer’s dream. Exquisite upgrades are found throughout, including limestone tile and a walk-in glass-enclosed wine refrigerator. An elegant Gulf-front lifestyle awaits, only moments from the fine dining and shopping of the Venetian Village, Waterside Shops and downtown Naples. Le Parc offers luxurious resort-style amenities including a spectacular beachfront pool and spa, state-of-the-art fitness facility, sauna facilities, a Har-Tru tennis court, two under-building covered parking spaces and a large reception room with a catering kitchen. All Park Shore condominium residents also have access to a lighted beach walk and the ability to lease or purchase boat accommodations at the Venetian Bay Yacht Club. Aria Park Shore Condos: This luxurious residence, built out by London Bay Homes, with three bedrooms, a library, three screened terraces, a comfortable family room, formal great room, and separate dining and breakfast areas, has dramatic Gulf views. Additionally, Aria is known for its extraordinarily, elegant common areas, a variety of well-maintained and exciting common amenities, and twenty-four hour security. One of the most coveted units in Aria, with direct Gulf views, this residence is also on a floor level that puts all elements of nature in picturesque context. The celebrated shopping & dining of The Village on Venetian Bay is just moments away. Available for immediate showings. Provence Park Shore Condos: THE BEST OF THE BEST! This sensational seaside residence captures explosive Gulf, Bay and City views. Impeccably designed and architecturally enhanced, this home boasts a spacious interior featuring over 4,500 square feet providing the ambience of a gracious lifestyle. The exceptional floor plan has a spectacular gallery upon entry, open great room with a custom wet bar, den, dining room, gourmet kitchen open to a cozy breakfast and family room. The expanded Master suite includes a sitting area with a wall of glass and stunning Gulf views. In addition, the three guest suites are all-inclusive. Two huge screened lanais with expansive views! With first-class amenities, security and a location nestled directly across from Venetian Village, enjoy fine dining and boutique shopping along the prestigious Gulf Shore! Provence Park Shore Condos: From sunrise to sunset, this rare SW corner 11th floor is the perfect level to take in the bay and city views to the east and the sand, surf and sunset views to the west. New pearlescent Venetian plaster, textured stone floors and warm woods define the ambiance and are further enhanced by a new Ruffino designed kitchen. The spacious floor plan lives like a single-family home with plenty of room to gather or find a quiet spot to enjoy the surrounding tropical landscaping and water views. All of this is enhanced by the ten-foot ceilings, window walls of glass and two large terraces facing south and west. Provence is ideally situated across from the shopping and dining in Venetian Village. The building offers an array of amenities including guest suites, a recently renovated lobby, social room and private dining room, a state-of-the-art fitness center and beachside pool. Pet-friendly! Le Jardin Park Shore Condos: C.15197 - This is a rare opportunity to own a unique and lavish Gulf Shore Blvd. condominium with a fantastic and one of a kind 1178 sq.ft private deck that will allow you to capture the best sunsets of your life. The unit compliments itself with a very spacious and open floor plan comprised of slightly more than 4300 sq.ft, 3 Bedrooms, 3.5 Baths, Den, Wet Bar, spacious Laundry Room and much, much more. Enjoy fantastic views of the Gulf and Venetian Bay from multiple locations facing both East and West. One of the best Park Shore high-rise buildings with excellent reserves, 24 hour security, front desk, guest suites, gulf side pool and spa, tennis court, grilling area, sauna, fitness center, and social room. 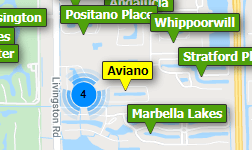 All this and conveniently located within walking distance to the shops and restaurants of Venetian Village. Le Jardin is one of the truly sought after addresses in Naples for families with pets, including large dogs. BONUS: The fabulous deck has its own private access to the pool, beach, and your parking spaces. A limited one of a kind opportunity! Le Parc Park Shore Condos: Enjoy stunning Gulf of Mexico views from every room in this luxurious turnkey Le Parc residence. Rarely available, southwestern exposure with nine-foot floor to ceiling windows that draw your attention from every room. Beautifully decorated for luxury and comfort! This amazing residence offers three bedrooms plus a den, gorgeous new designer kitchen with custom cabinets and marble countertops, breakfast room, great room concept with formal dining that overlooks the Gulf, master bathroom with two walk-in closets and more. This highly sought after Le Parc high-rise with resort style amenities includes a fitness center, Har-Tru tennis court, two social rooms, two guest suites, bike and beach chair storage, two assigned parking spaces and a car wash. The perfectly located pool and grilling area also allows you to enjoy the amazing views from the comfort of your poolside lounger. All Park Shore condominium residents have the ability to lease or purchase boat accommodations at the Venetian Bay Yacht Club. Come enjoy the Le Parc lifestyle! Le Jardin Park Shore Condos: Experience luxurious beachfront living as you step from secured elevators into your own private entry foyer into this open and spacious 3 bedroom plus den residence. Located on the perfect level to capture front to back views of the landscaped park, Gulf and Bay. Neutral backgrounds lend themselves to almost any decor. This residence lives like a single family home with a large living/dining room, a very spacious family room with a casual dining area, two privately located guest rooms and a master bedroom and bath with gorgeous Gulf views. Two large lanais capture amazing direct Gulf and Bay vistas. Le Jardin is a special low-density building. Its residents describe it as a “vertical neighborhood” because of the friendliness and socially active group of people that live there. Amenities include a wonderful party room/bar, fitness center, Har-Tru tennis court and 24-hour doorman service. Pet-friendly too! Le Parc Park Shore Condos: First time available for resale in Le Parc, this 11th floor 03 stack with direct west and north views offer unobstructed, panoramic views of the Gulf-all the way to Sanibel Island. Light and bright this spacious condo has 9ft. floor to ceiling windows, terraces are glassed with sliders that give you the ultimate all-weather, year-round enjoyment. Electric hurricane shutters provide peace of mind. Three bedroom and den with 3 bathrooms and powder bath. Temperature controlled wine closet. Interior storage closet. Le Parc offers a gated, walled entrance, 24 hour security and on-site manager. There is a spectacular 2-story lobby, a modern workout facility, har-tru tennis, and a beachfront heated pool and spa. 2 guest suites. The pool area is being refreshed and exterior lounge areas will be added this coming summer. Pet friendly. Le Parc is a sophisticated and elegant building built by Lutgert. Quiet and semi-private apartment entry with only 4 units per floor (2 penthouse) with 2 on each side of building. 2 deeded parking spaces under building and storage. Active social calendar and part of the Blue Zone healthy living community.Boat slips available to purchase/lease on Venetian Bay. Ardissone Park Shore Condos: C.15839 - Step from your private elevator directly into the foyer of your Grand Penthouse atop building #3 @ Ardissone. Immediately, the expansive floor plan unfolds before you, your eyes grasp bay water views and multiple covered terraces that span out in all directions inviting you in for more. Step through the full-length hallway taking in the massive living room, formal dining room, library, kitchen and walk-in pantry. Reverse your steps and the monsterous master en-suite with terrace, awaits you as does 3 additional en-suites, each with their own section of terrace overlooking your private boat slip and the Florida life-style activity along Gulf Shore Blvd. N. Complete with 2 deeded under-building parking spaces adjacent to the elevator, deeded beach access across the street, common pool/spa area, additional storage within the buildings, gated entrance and all that Venetian Village has to offer, just a short stroll away, this is a unique Park Shore location. Ardissone is also pet-friendly with some limitations. Make your appointment to today, let me welcome you home. Provence Park Shore Condos: Stunning Provence corner unit offers sweeping Panoramic Views from the 17th floor overlooking the white sugar sand beaches of the Gulf of Mexico and the beautiful Park Shore gardens. At 3,736 square feet under air, four bedrooms with one bedroom currently set up as an office, and five baths (4 full and 1 half bath) this residence truly lives like a magnificent beachfront home. Provence #1704 features ten-foot ceilings, eight-foot doors, large open great room, two screened outdoor lanai areas, impact windows throughout, a gourmet kitchen, separate dining area, and a large master bedroom suite. Provence also offers 24-hr front desk personnel, social room, fitness room, pool area with grills, tennis, two guest suites and two assigned parking spaces. Provence is pet-friendly as well. Conveniently located directly across Gulf Shore Boulevard from the shopping and dining of The Village on Venetian Bay. Le Ciel Park Tower Park Shore Condos: Imagine walking into this extraordinary panoramic view of the Gulf, with floor to ceiling glass windows. You will feel like you are on a luxury cruise ship looking out at an endless water view of the Gulf of Mexico. Marble flooring throughout the home enhancing the tropical furnishings and decorations make this home true luxury living. The bright and light kitchen has custom handles, island with breakfast bar, built-in desk, and white appliances. The eat-in kitchen area is nestled in the custom curved wall design and provides a beautiful view of the bay and Gulf. The master suite has unobstructed ocean views and access to the balcony. The en-suite boasts dual sinks, a large soaking tub, enclosed private water closet, bidet, and Corian countertops. The guest suite is looking over the bay with panoramic glass views, a sitting area, and a private bath. The den/bedroom has a custom built-in desk and access to the balcony. This penthouse lives like a private luxury home with the amenities of Le Ciel Park Tower. Private pool and spa overlooking the beach, fitness center, outdoor kitchen, and Tennis. Aria Park Shore Condos: Stunning southeast 3rd floor condominium boasts 4 bedrooms and 3 full baths within 4,096 square feet of open floor plan living. Master suite offers his and her walk in closets, separate tub and shower, and separate water closet room. The second guest suite also offers a walk in closet and separate tub and shower as well. The spacious family room has a gas fireplace and looks out towards the bay while the living and dining rooms look out towards the gulf. Aria boasts an array of amenities including two luxurious guest suites, fitness center, men’s and women’s spas with massage room, social gathering room, billiard room, and the outdoor pool and spa has an outdoor kitchen and with grills. Shopping & dining down at The Village on Venetian Bay are just steps away. Boat slips are available with the Venetian Bay Yacht Club. All information is believed to be accurate but not guaranteed and should be independently verified. Aria Park Shore Condos: C.14174 - Quality abounds in the contemporary masterpiece. this pristine fifth-floor abode lives like a private residence in a luxurious condo; 3 bedrooms plus den or 4 bedrooms, 3-bath floor-plan totaling 5096 square feet. Clean-lined aesthetics are set off by light colored porcelain tiled floors, white cabinetry in the kitchen, floating shelving and media wall in the sun-drenched family room & quality lighting throughout. The private master suite opens to a screened terrace and features customized walk-in closets plus, a luxurious owners bath. Three spacious guest suites in their own corridor of the condo are perfectly situated off of the family room wing. All thoughtfully and expertly implemented throughout this contemporary masterpiece. Amazingly tranquil views of the bay and gulf with sparkling city lights at night. You'll love the well-appointed facilities of this luxury building & the stunning architectural elements of the Aria in Park Shore. The Aria is Park Shore’s newest building located across the street from Venetian Village shops & restaurants. Aria residents can also purchase or lease boat docks at the Venetian Bay Marina. This is a dog friendly building as well! Ardissone Park Shore Condos: C.15371 - Enjoy Park Shore waterfront living at its best on and above Venetian Bay. This particular Ardissone Grand Penthouse condominium atop Building 6, occupying the entire top floor, is the northern-most unit within the complex touting expansive and multiple sparkling bay water views. This special piece of paradise is encased with open-air balconies and decks that bring the outdoors to you. A kaleidoscope of outdoor colors and lights paint the scenery both day and night. Your private elevator entrance opens to a spacious floor plan that invites comfort and flow for everyday living and makes entertaining an event. Roomy kitchen, both formal and leisure dining options, family room, great room, den/office, wet bar, LARGE master suite with terrace and sitting area, 2 guest bedrooms, 2.5 baths, sizable laundry room and storage galore. Don't forget the deeded boat slip, 2 under-building parking spaces, deeded beach access and walking distance to all that Venetian Village has to offer. I'm out of breath and you will be too when you see this beautiful condominium and water setting. Aria Park Shore Condos: Enjoy gorgeous Gulf and Bay views from this fabulous mid-level location in Park Shore’s newest high-rise! Just steps to the beach, this beautiful home in the sky provides over 3,400 square feet of luxurious living, 3 bedrooms, 3 baths, nearly 10’ ceilings, 8’ doors, beautiful hardwood floors, an updated master bathroom and a newly updated kitchen with custom white cabinets, stainless steel appliances, quartz countertops and a large walk-in pantry. This residence has its own PRIVATE TWO-CAR GARAGE which is a rare and wonderful amenity! The building amenities include a social room, fitness room, billiards room, large pool and spa, two guest suites, 24/7 manned front desk and a resident manager. Brittany Park Shore Condos: C.15083 - Unrivaled design & lavish finishes make this exceptional Park Shore residence an entertainers dream. Encompassing a full panoramic beach to bay layout, the 3 BR, 3.5 BA boasts radiant marble floors, stunning built-ins, floor to ceiling windows, exquisite lighting & designer touches throughout. Sumptuous Owners’ Suite has beachfront lounging, custom walk-ins, dual vanities & a spa tub with fantastic faucets! The luxurious Grand - Salon encompasses a full windowed terrace for year round enjoyment & the elegant formal Dining Room will create grand impressions of royal dining. Customized Kitchen takes full advantage of views while adding sizable storage! Morning Room & Den enjoy breathtaking vistas of the bay and twinkling city lights. Sip your morning coffee watching vibrant sunrises over Venetian Bay; enjoy evening cocktails mesmerized by dazzling Gulf sunsets. Picture this as an everyday opportunity! Freshly updated with 2 guest suites that will have your family enjoying private time as much as they love the family get-together time. The Brittany is amenity rich: with fitness room, tennis courts, beachfront pool, spa. Unit has two enclosed parking spaces. Simply fabulous!